M G University B.Com final year exam 2014 result has been published. The result of the final year exam conducted in March 2014 is now available in the University website. Candidates who had appeared for the exam can check the results from the online portal of the University. Know more about the result. 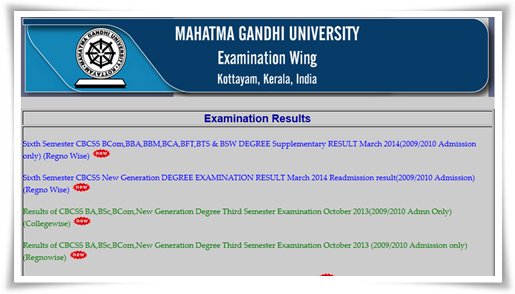 Mahatma Gandhi University (M G) has published the final year result of B.Com exam held in March 2014. The result of 15 courses including B.Com, B.B.A, B.T.S, B.S.W, B.F.T have been published in the University website. Students who had appeared for the exam can check the results from the online portal of the University. Out of 11674 students who appeared for the exam, 9828 got passed. Among 3194 students attended the B.Com (Model I) exam, 2952 went through the exam making 92.42% pass percentage. All the students of Thripunithara Govt.College, Kanjirapally S.D College, Maliankara S.N.M, Cochin College and Aluva St.Xaviers who had written the B.Com (Model I) exam succeeded in passing the exam. 7 students got A+ in all subjects. Among them, 5 represents Thevara Secret Heart College and 2 are from Ernakulam St. Theresa's College. For B.Com (Model 2), all students of Presentation College Puthenvelikara, Cherppunkal B.V.M, Thiruvalla Marthoma College and Edathuva St Alossius cracked the exam. Meanwhile, Amalagiri B.K College too got the success credit after all the students passed the B.Com (Model 3) exam. For the revaluation and scrutiny of the answer scripts, application can be submitted till 5th July 2014. Students who wish to apply for the revaluation can avail the form from the University or download it from the University website. The prescribed forms should be submitted before the specified time along with the fee for revaluation. The applications which are received after the last date notified will not be entertained. The application for scrutiny should be submitted in the form along with the prescribed fee. The fee shall be directly remitted at the Mahatma Gandhi University cash counter or by way of DD drawn in favour of the Finance Officer, Mahatma Gandhi University Campus Branch. The cash receipt or DD must be forwarded (in original) to the Controller of Examinations along with the application.